Go Visit This Restaurant By Selecting the Link to the Far Left "Want Name/Address." 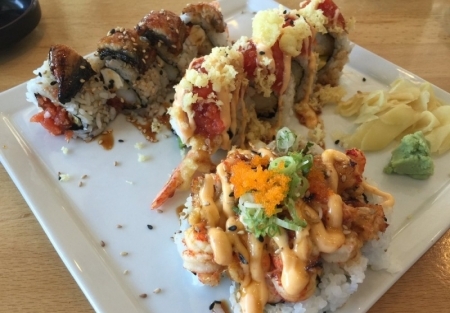 This Sushi Restaurant has served this family oriented community for 7+ years. A few years ago, as they maxed out their other location, they moved into a larger shopping center with much more seating. They have nicely grown the business and added a pation to their seating arrangements. REASON FOR SELLING: At this time they have a family member that is quite ill and they need to leave the area to help care for the person. The restaurant is known for the Freshest of Fish and the Signature Sushi Rolls, deliciously prepared Tempura and their grilled items as well. The ratings on Yelp on some of their specialty items shows their commitment to quality. ABOUT THE RESTAURANT SPACE: The restaurant seats 44 inside and 14 on the patio. The restaurant has an open dining room floor plan allowing tables to be easily arranged to accommodate larger parties when needed. They have a 14 foot grease hood and a 6 foot oven exhaust hood. With 10 burners, 2 deep fryers, a grill and flat top grill there is no lack of equipment to keep up with the crowds. The Sushi Bar has 2 refrigerated display cases to highlight the Fresh Seafoods. Guests can watch the Sushi Chefs prepare the beautifully prepared rolls and sashimi dishes while they munch out themselves. The restaurant has 2,000 Sq Ft with a Total Rent of $6,400 (this includes the NNN Charges). Sales have been in the $500- $525,000 range on tax returns since entering the new larger location. Costs have been maintained very will allowing owner to net $50K+ in 2016 and over $100K in 2015. The reason for the big change is The husband and wife have both been running the business but they had their first child at end of 2015 and have hired more help as owners wife is at home caring for their child and owner takes more time off also to be home more with family. Come on by and see if this is not the opportunity you have been looking for, and don't forget to enjoy some of the great Sushi when you're there.